In this hands-on job training program for electricians, you’ll learn residential and general electrical skills, wiring and installation. The hands-on part of the class includes planning and installation. Just like in a real job, you’ll be asked to connect wires to circuit breakers and to test electrical systems using power tools and other digital equipment. You’ll also inspect, troubleshoot, and repair electrical systems. Upon graduation, you’ll be prepared to qualify for your Electrician in Training (ET) card and we will help you find a job in the electrician field. Say yes to CET Electrician! Training supplies, electrician toolkit, books, uniforms included at no additional cost? ** yes! Where do the electrician job training classes take place? 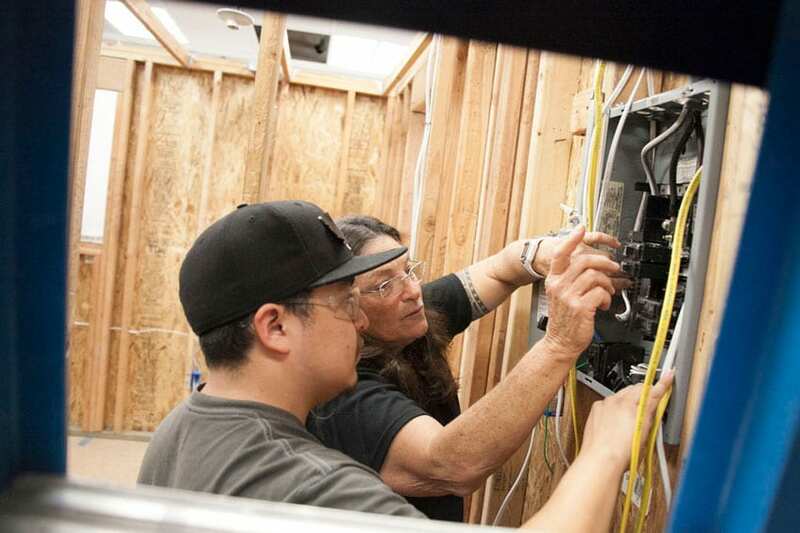 Train to be an electrician on CET’s campuses in Sacramento, Soledad, CA and San Jose, CA. You will be working in a fully stocked, full-size lab where you’ll practice installation, troubleshooting, and repair of electrical systems. How long does it take to finish the electrician job training program? When does the next electrician class start? Right now! We have an open enrollment so you can jump in at any time. CET’s open enrollment means once your application is completed you can start the next day. On occasion a class may be full, but you can get on a wait list. If your application is complete, once there is a space available, you are ready to go. After taking these electrician courses, what kinds of jobs can I find after I graduate? How soon after graduation will I start working as an electrician? Every student’s experience is different, but according to the Bureau of Labor Statistics, the electrician occupation has a higher than average job growth. To see what the job outlook is like for electricians where you live, go to onetonline.org and plug in your state in the section for “Wages and Employment Trends.” And with CET’s job placement assistance, you will always have ready help to find the right job. What can I expect to make as an electrician? How much does it cost and how can I pay for this electrician job training program? The electrician program costs $15,375 including your training supplies, electrician toolkit, books, and uniforms. If you qualify for financial aid, you may be eligible to receive grants, scholarships and/or federal student loans. How big are the electrician job training classes? Class size is approximately 20-25 students and can vary by program. As part of the Electrician program, you will have the opportunity to qualify for the Electrician in Training (ET) card. A certificate of graduation and an ET card show an employer that you are ready for an entry level position as an electrician. No. You’ll get everything you need in the class, including vocational English and math. Additional one on one tutoring is available, if needed. CET is national, but what about the graduation and job placement rates for Electrician students at my CET location?